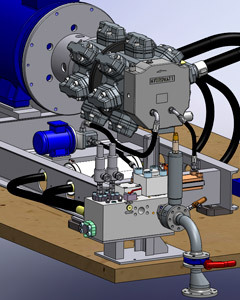 HYDROWATT offers complete system solutions for a broad range of applications, covering the pump frame, motor and bell-housing, as well as control valves, associated piping, electronics and other components. Modern visual 3D-CAD technology aids the construction process, allowing us to adapt swiftly to specific conditions. The huge variety of applications has challenged us over the years, but it has increased our systems knowledge enormously. Our experienced engineers are there to help you find the best solution for your project. Here, you will find a few applications where HYDROWATT pumps are in use.